This golden coin turtle is special – it has more than the average number of heads. It was found at an animal market in Qingdao China and according to press reports, it seemed to be functioning normally – with both of its heads cooperating and even able to eat at the same time. 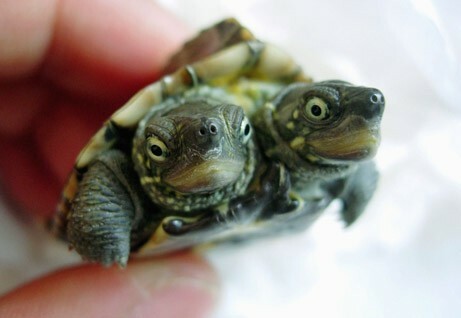 The turtle was most likely a conjoined twin (also known as Siamese twin), a condition in which the bodies of siblings are joined before birth.